SUE STRATFORD: WHY YOU SHOULD SWAP... | Top Crochet Patterns . Over the years I’ve become a bit of an eclectic knitter – I love the challenge of trying something new and always have a long queue of things that I want to make. When I was younger I was very much a garment knitter. I made a few toys when my children were small, but it wasn’t until I had a yarn shop that I really got excited about toys. I started using yarns that didn’t sell and quickly found that I was ordering specific yarns because they’d sparked an animal idea. 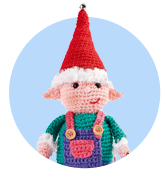 These days I wouldn’t be without a toy on my needles – it’s certainly addictive! Committing to the time it takes to complete a garment is quite a challenge; I’m fine with knitting the front, maybe most of the back, but I get to the sleeves and my enthusiasm wanes. Toys are generally smaller projects and can be made quickly – they satisfy the part of me that wants an instant result. I also find that I enjoy the sewing up as much as the knitting, which is something you don’t often hear a knitter say! When you’re sewing the toy together and creating the features the character begins to appear, which is simply irresistible. 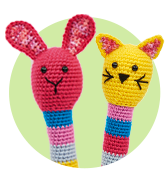 If you’re a new knitter, making toys is a great way to try a variety of techniques – you have fewer stitches to work on so if something goes wrong you can easily undo your work and remake it. I’ve met people at shows who’ve taught themselves to knit from one of my toymaking books Knit Me, Dress Me, Love Me. It actually contains all the techniques you would need for making garments and accessories but in a miniature format. If you’ve never done a particular stitch before, try it whilst making a toy – it’s much more fun and cuter than a swatch – then transfer the skills you’ve learnt onto a larger project. Sometimes knitting time is short for me so I like to buy garments as gifts with the addition of a knitted toy that hasn’t taken me too long to make. I never actually need an excuse to cast on a new toy though. In fact, I started one today! Next time Sue takes a look at family heirlooms.